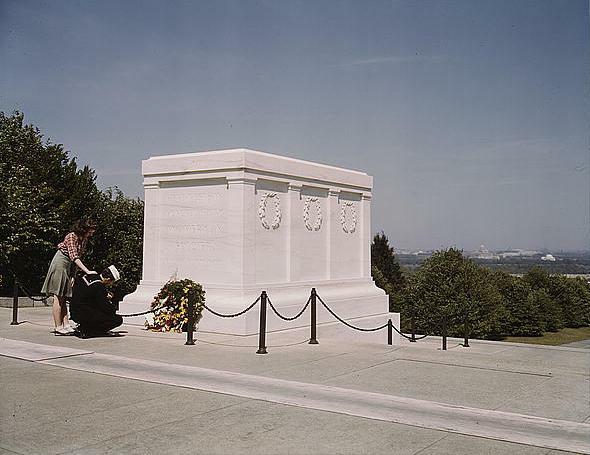 From the Library of Congress American Memory Collection: a sailor and his girl visit the Tomb of the Unknown Soldier in May 1943. For Memorial Day weekend, Daffy Duck turns commando to take on Hitler. From the Internet Archive, here is the 1943 short, Daffy the Commando. The American public's interest in fuel ecnomony waxes and wanes, but there are always some people for whom it is a significant concern, even when everyone else wants big cars with big engines. Take Alfred Raymond Russell for instance. 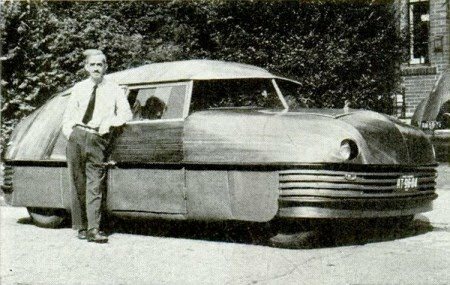 A post on the Hemmings blog tells at least part of the interesting story behind this progressive, if unorthodox, automotive designer and his plywood and plastic bodied cars with hydraulic drive. 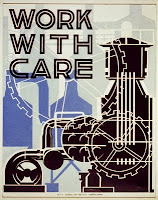 In 1942, while the rest of the automotive world geared up for the production of war machines, and while every other backyard tinkerer spent his time dreaming up novel ways of defeating the Axis, Ray Russell set out to radically alter the fundamental design and makeup of the automobile. Of course, with a war on and with chrome-plated, gadget-covered hearse production suspended, nobody seemed to really care. The public's lack of interest did not stop him from trying, and he developed a few interesting designs along the way. Today's Sunrise Serenade was "Beer Barrel Polka" by the Andrews Sisters. Click on the song title to listen courtesy of Jazz On Line. Another set of interesting events on the same date - May 27 - from The People History. May 27, 1936 - The Cunard liner RMS Queen Mary leaves Southampton on her maiden voyage to New York with more than 1800 passengers. May 27, 1937 - The Golden Gate Bridge connecting San Francisco and Marin County, California is opened to pedestrian traffic and more than 200,000 pedestrians walked across on opening day. The next day the Golden Gate Bridge is opened to vehicular traffic. May 27, 1943 - The ballpoint pen is patented in America by Hungarian Laszlo Biro. This morning's Sunrise Serenade was the very pleasant "Skies Are Blue" by Andy Kirk and his Clouds of Joy. Click on the song title to listen courtesy of Jazz On Line. The playlist for the May 26, 2010 broadcast of the Swing Shift Shuffle has just been added to the playlist filing cabinet. Here is a great shot and caption from Film Noir Photos. 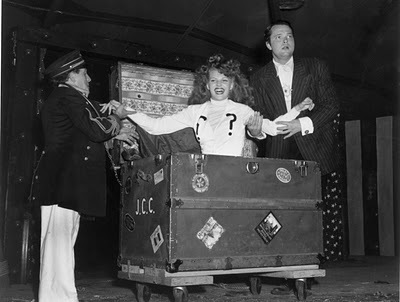 Rita Hayworth and (soon-to-be husband) Orson Welles performing in “The Mercury Wonder Show,” August 1943. Combining magic, carnival, and humor, the show was part of the home front war effort put on for servicemen during the war. This morning's Sunrise Serenade was another hard-to-find number, "Pizzicato" by Stan Kenton. Click on the song title for the album page on Amazon. Sample clip at Track #25. There will be live music at the Red Hot Lindy Hop lesson and session this Friday night. The lesson will be by Kirk and Becky, and music by Paul Morelli & and the Flying Squid Battalion. This morning's Sunrise Serenade was one of my favorite, sweet songs, "Paper Doll" by the Mills Brothers. Click on the song title to listen courtesy of Jazz On Line. I remember comic books that featured real-life celebrities (actors, musicians, etc) as themselves, and told of the adventurous lives they led outside their primary professions. 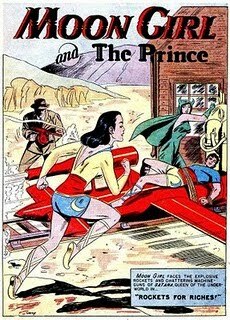 Pappy's Golden Age Comics Blogzine posted about a 1949 comic book with Alan Ladd as the adventurous hero. "In the comics Ladd was presented as what he was, a movie star, albeit a star who got into adventures apart from his movie career. 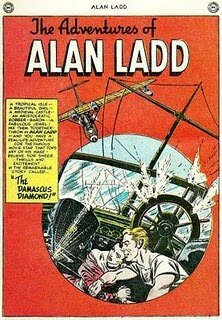 According to the Grand Comics Database, "The Damascus Diamond," from Alan Ladd #1, is drawn by Joe Certa and Sy Barry. It takes its plot from The Maltese Falcon." Today's Sunrise Serenade was "Sliphorn Jive" by Glenn Miller. Click on the song title for the album page on emusic. Sample clip at Disc 1, Track #16. Of all the Warner Bros. characters, Porky Pig was never my favorite. I have to admit that this cartoon, however, is quite cute. From the Internet Archive, the 1937 animated short Porky's Railroad. Here is another interesting historical coincidence from The People History. 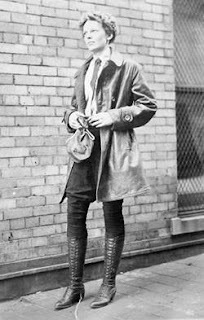 On May 21, 1932, five years to the day after Charles Lindbergh landed in Paris to become the first man to fly non-stop across the Atlantic Ocean, Amelia Earhart became the first woman to make a solo flight across the Atlantic. Perhaps weather conditions made that time of the year ideal for such a flight. Today's Sunrise Serenade was "Nero's Conception" by Woody Herman. Click on the song title for the album page on Amazon. Sample clip at Disc 2, Track 18. Speaking of Lindy Hop, The People History notes that the man who gave the dance its name began his famous "hop" on this day in 1927. Charles Lindbergh set off from Roosevelt Field in Long Island, New York, on May 20, 1927 flying the "Spirit of St. Louis" on his epic flight from New York to Paris. He completed the 33-hour, 30-minute flight on May 21, landing at Le Bourget Airport, Paris. Photograph from the Library of Congress American Memory Collection. My unconscious must have been thinking about the passing of Lena Horne, because this morning's Sunrise Serenade was "Old Devil Consequence" by Lena Horne and Eddie "Rochester" Anderson from the 1943 movie Cabin in the Sky. This particular performance of the song is not from the film itself, but rather from what appears to be the filming of a radio or recording session performance. The playlist for the May 19, 2010 broadcast of the Swing Shift Shuffle has just been added to the playlist filing cabinet. This morning's Sunrise Serenade was "Someday Sweetheart," but it was difficult to determine which artist and version. I finally settled on this recording by Benny Goodman. It was the closest to the tune in my head. Click on the song title to listen courtesy of Jazz On Line. The Red Hot Lindy Hop lesson and session rolls on this Friday night with a lesson by Mike and Erin, and music by Alexis. Free admission before 7:00 p.m., and $5 at the door afterwards. Next week - May 28, 2010 - Live music by Paul Morelli and the Flying Squid Batallion. This morning's Sunrise Serenade was "Russian Lullaby" by Stan Kenton. This version was harder to find than usual, as my customary resources did not have it. Click on the song title for the CD page at Amazon. Sample clip at Track #16. I see these 1930s science fiction story books at flea markets and antique shopes from time to time, but I can never bring myself to buy one. 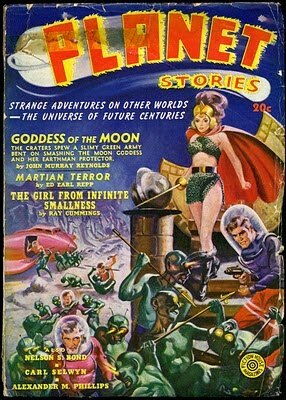 Golden Age Comic Book Stories posted about 30 of these Planet Stories covers. I really must give it a shot. If they are half as entertaining as the covers, they would be worth the price I usually see. This morning's Sunrise Serenade had a spiritual groove. It was "Shadrack" by the Golden Gate Quartet. Click on the song title for the album page on emusic. Sample clip at Track #8. It is time once again for the Man of Steel. In this episode, Superman must protect a runaway train full of gold from a determined gang of robbers. From 1942 and the Internet Archive: Billion Dollar Limited. How is this for a visual aid? Boing Boing referred to a post on Strange Maps about a publisher of pulp fiction books that printed maps of the crime scenes on the back covers of the paperbacks: Maps of Murder. Dell Books, the American series of pulp fiction books, featured many genres, but most of all the detective story. A prominent feature were the maps on the back cover, setting the scene for the adventures experienced and crimes committed within the covers. An amazing 577 grand total of ‘Map Backs’ would be published during the lifespan of the series, from 1943 to 1952. 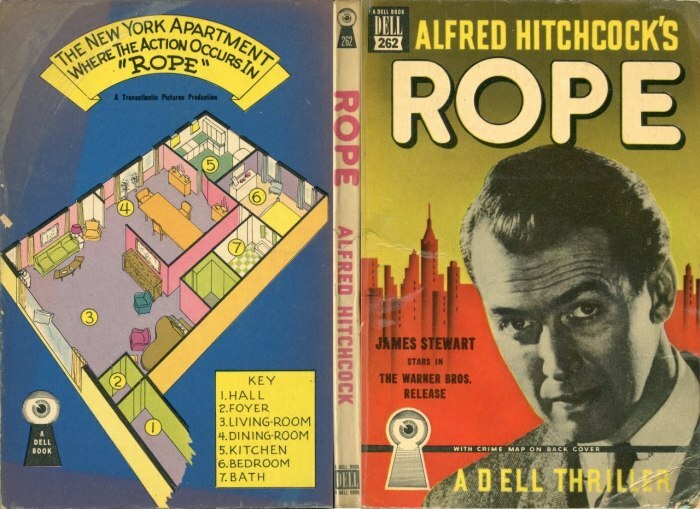 The example above is Rope, which is an excellent movie. Aside from the interesting plot, every scene in the movie takes place in the apartment, and the movie plays out in real time. Every minute of film is a minute in the story. Hitchcock also shot the film in such a way that it appears to be one, long, continuous shot. There are no cuts or jumps. A real intense thriller, even though you know who did it from the very start. Today's Sunrise Serenade was an encore from March, "Smoke Rings" by the Mills Brothers. Click on the song title to listen courtesy of Jazz On Line. I knew that John Wayne was prolific actor, and that I had not seen all of his movies, but a post on Golden Age Comicbook Stories reveals the massive extent of my understatement. 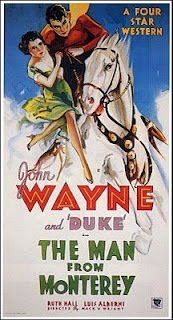 In the scan of over 50 John Wayne movie posters, I had only seen one of the films, and heard of a few others. The rest were completely unknown to me. Many are early westerns, but there are also some non-western films. By the way, "Duke" was Wayne's horse. Today's Sunrise Serenade was a duet, "Oops!" by Louis Armstrong and Ella Fitzgerald. Click on the song title to listen courtesy of Jazz On Line. The playlist for the May 12, 2010 broadcast of the Swing Shift Shuffle has just been added to the playlist filing cabinet. 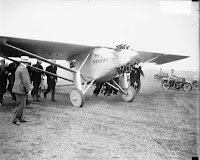 In 1928, Bernard Pietenpol designed and built his own airplane with a automobile engine, hardware store parts and scavanged materials. As noted by this post on Boing Boing, his family continues to sell the plans for the same aircraft, which can be built for less than $2000. This morning's Sunrise Serenade had an exotic flavor. It was "Song of India" by the Dorsey Brothers. Click on the song title for the album page on emusic. Sample clip at Track #9. The weekly Red Hot Lindy Hop lesson and session continues this Friday night with a lesson by Matt and Amanda, and music by Amanda. Free admission before 7:00 p.m., and $5 at the door afterwards. Today's Sunrise Serenade was "My Walking Stick" by Louis Armstrong, with help from the Mills Brothers. Click on the song title for the album page on emusic. Sample clip at Track #11. On Mother's Day 2010, we lost another one of the great icons who arose in the swing era, Lena Horne. The weather is rainy in Memphis this morning, so I can think of no better tribute than her signature tune, from the 1943 movie of the same name, "Stormy Weather." Yes, that is Cab Calloway leading the band. This morning's Sunrise Serenade was the peppy "Free For All" by Artie Shaw. Click on the song title to listen courtesy of Jazz On Line. Daffy Duck and Elmer Fudd mix it up in the boxing ring in this classic Warner Bros. short from the Internet Archive. Here they are in To Duck Or Not To Duck. To me, this post on Pappy's Golden Age Comics Blogzine provides one explanation why the 1930s, '40s and '50s were the golden age of comic books. Simply put, there were so many of them, that the ones that lasted had to be really good to survive. I mean "Moongirl"? The villian is "Satana," who wears the little green evening dress with a cape and cowl that has horns on it. Fans of classic Warner Bros. cartoons will appreciate this morning's Sunrise Serenade. It was "Huckleberry Duck" by Raymond Scott. Click on the song title to listen courtesy of Jazz On Line. As noted by The People History, on May 6 1935, the Works Progress Administration (WPA) opened, providing thousands of unemployed Americans decent paying jobs on a wide range of public works projects including parks, playgrounds, major infrastructure projects, schools and post-offices. 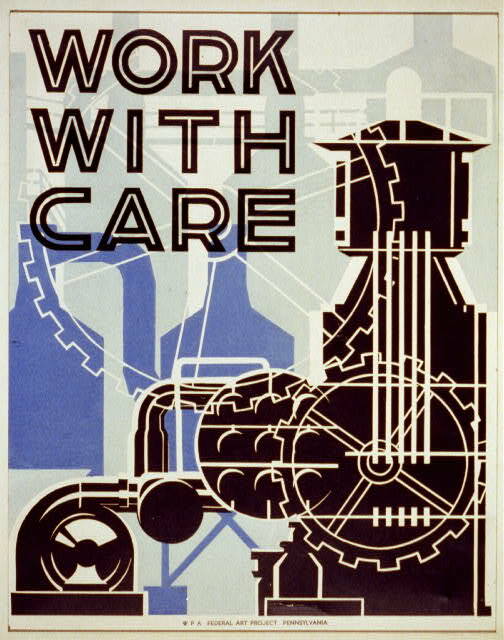 During its eight year existence the WPA employed 8.5 million Americans, including the artists who created the poster at right from the Library of Congress American Memory Collection, WPA Posters. Today's Sunrise Serenade was "Your Driving Me Crazy" by Chattanooga native, Valaida Snow. Click on the song title to listen courtesy of Jazz On Line. The playlist for the May 5, 2010 broadcast of the Swing Shift Shuffle has just been added to the playlist filing cabinet. 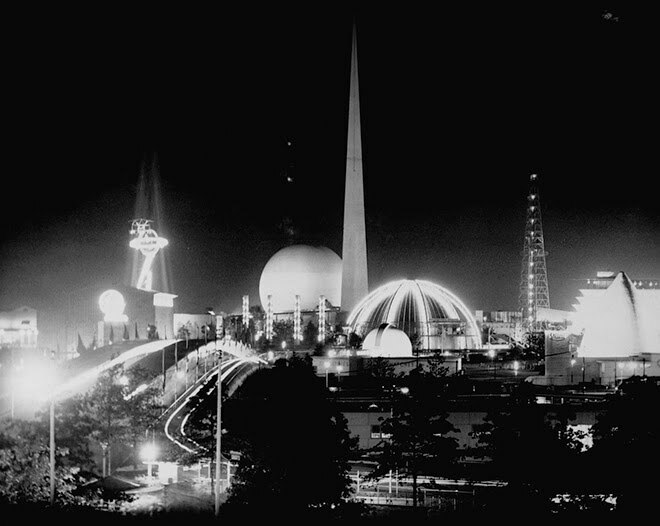 Continuing the theme originating in Friday's post about the opening of the 1939 World's Fair on April 30, Wired has a nice item with photos on how the "World of Tomorrow" Shaped Our Today. It was a futuristic city inspired by the pages — and covers — of pulp science fiction: huge geometric shapes, sweeping curves, plenty of glass and chromium, and gleaming white walls. 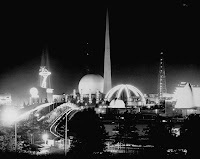 The fair was the last great blossoming of the Streamlined Moderne style of Art Deco. It was also heavily influenced by the still-rising International Style of such architects as Le Corbusier and Ludwig Mies van der Rohe. This morning's Sunrise Serenade was "Back Bay Shuffle" by Artie Shaw. Click on the song title to listen courtesy of Jazz On Line. The Friday night Red Hot Lindy Hop lesson and session continues with a lesson by Jaredan and Jeska, and music by DJ Jaredan. Free admission before 7:00 p.m., and $5 at the door afterwards. Sunrise Serenade: Bye, Bye Baby? This morning's Sunrise Serenade is a puzzler. I believe it was an instrumental by Bob (Bing's little brother) Crosby called either "Bye Bye Baby" or "Say Bye, Bye," but I cannot find a version anywhere that matches the tune. Never fear, I will investigate this mystery and report my findings! UPDATE: I was right! It was "Bye Bye Baby," just a hard to find instrumental version. Click on the song title to hear a sample courtesy of ArtistDirect. Happy Birthday to Harry Lillis "Bing" Crosby, born on May 3, 1903. 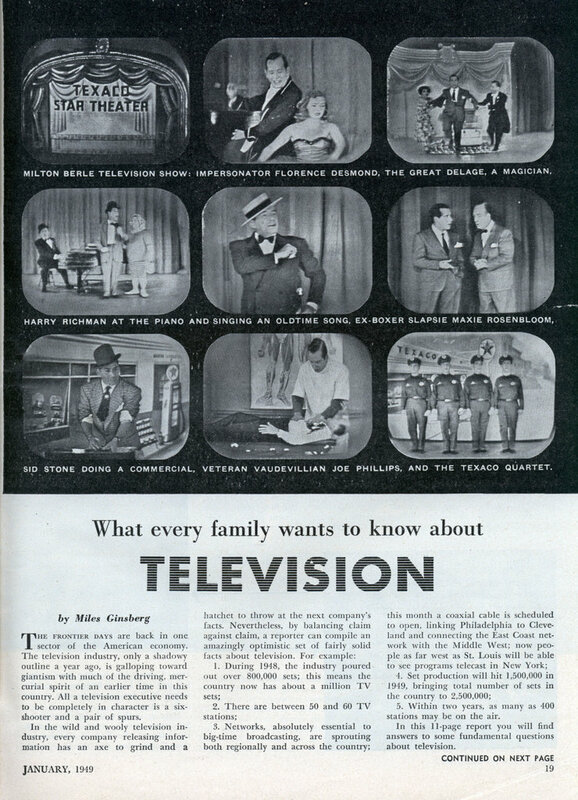 In addition to his singing and acting, Bingo had a significant influence on radio, and eventually television production. Click on Bing's name for more interesting info. For now, however, enjoy one of my favorites. Today's Sunrise Serenade was one of my all-time favorites, "Hawaiian War Chant" by Tommy Dorsey and his Orchestra. Click on the song title for the album page on emusic. Sample clip at Track #7. There are several recordings of this tune by this artist, but I like this faster version. Looney Tunes joins the war effort as Porky Pig and Egbert the dog hunt down Missing Lynx, a Nutzy Spy. I especially like the visual pun on the song "Hallelujah, I'm A Bum." From the Internet Archive, the 1942 animated short, Confusions of a Nutzy Spy.